in category: EDUCATION, myForest for education, OneOak project, Timber! 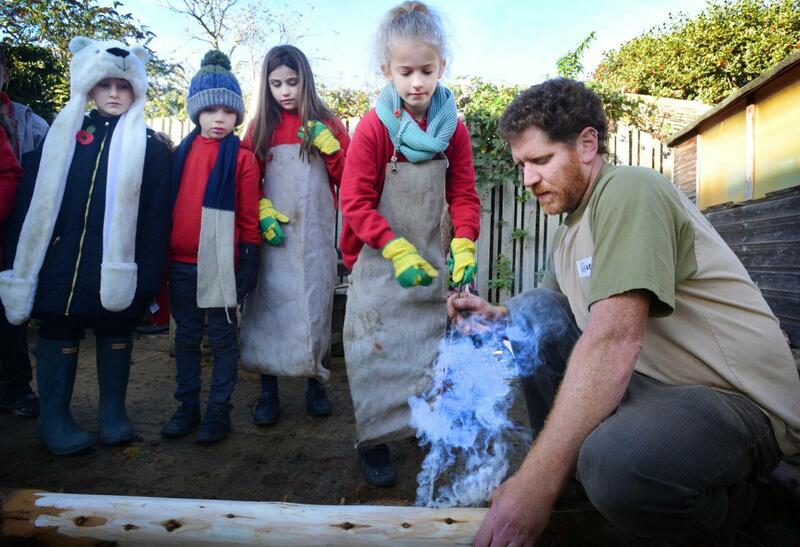 An innovative week-long programme of outdoor and indoor education about trees, forestry and wood — Wood Week — was developed and tested with one lucky primary school. 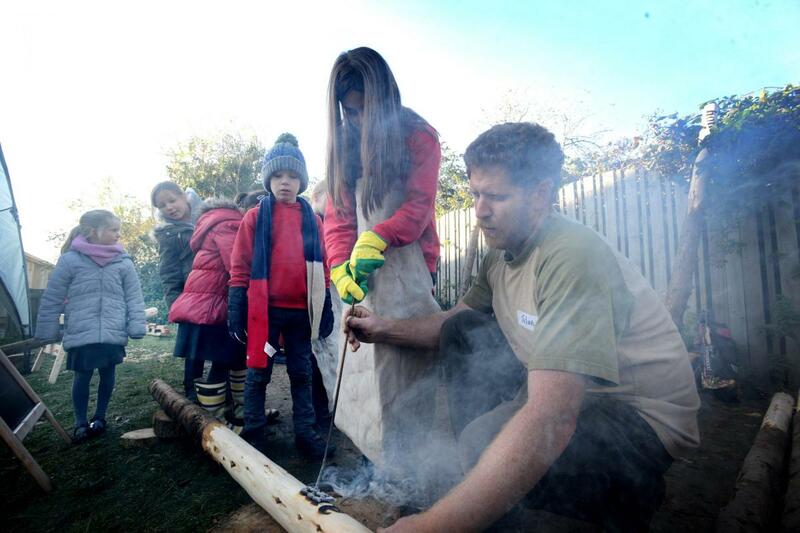 Sylva Foundation’s Education Manager Jen Hurst teamed up with Forester Paul Williams, Carpenter Julian Angus and staff at Combe Church of England Primary School to provide children with a week-long programme of activities on the topic of British trees, forestry and wood. This was supported by head teacher Charlie Marshall as part of the school’s new Curiosity, Creativity and Challenge curriculum. The week kicked off with an assembly on the OneOak Project which provided the school with inspiration and ideas for their own tree; a Norway Spruce to be felled in the school grounds. On Day Two Paul Williams of Trees and Gardens came into school and ran forestry workshops for the children explaining his work and equipment. 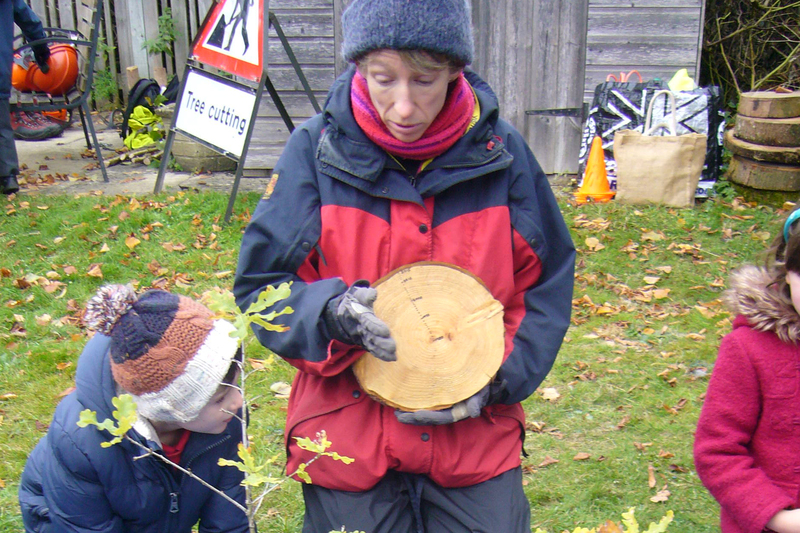 Jen worked with children to learn more about Norway Spruce, its biology and value and to estimate the height and age of the tree before its felling. Once felled the children re-measured the tree and watched Paul cross cut the trunk 122 rounds so that each child took one home. Julian Angus runs his own carpentry business from the Sylva Wood Centre but also works with schools to make wood products. 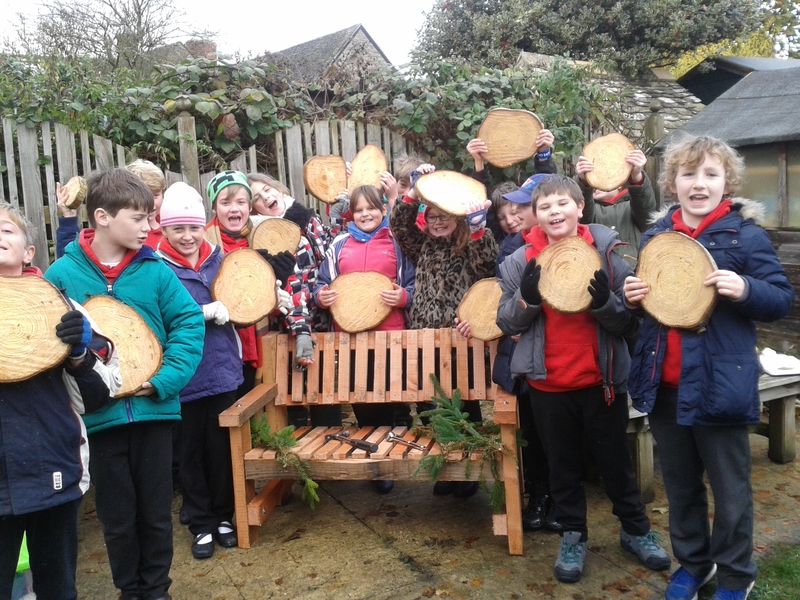 On Day Three of Wood Week Julian set up a ‘pop up’ wood workshop in the school grounds and gave the Key Stage 2 (aged 7-11 years) the task of making two benches out of Douglas-fir timber. 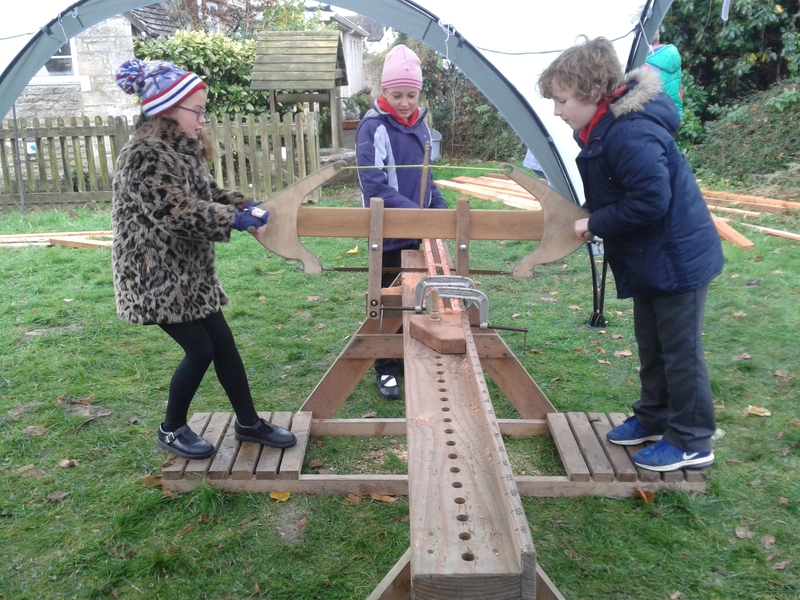 The children were completely hands-on measuring, sawing, hammering, bolting and working as a team. The benches are needed by the school to increase the seating area for outdoor learning. 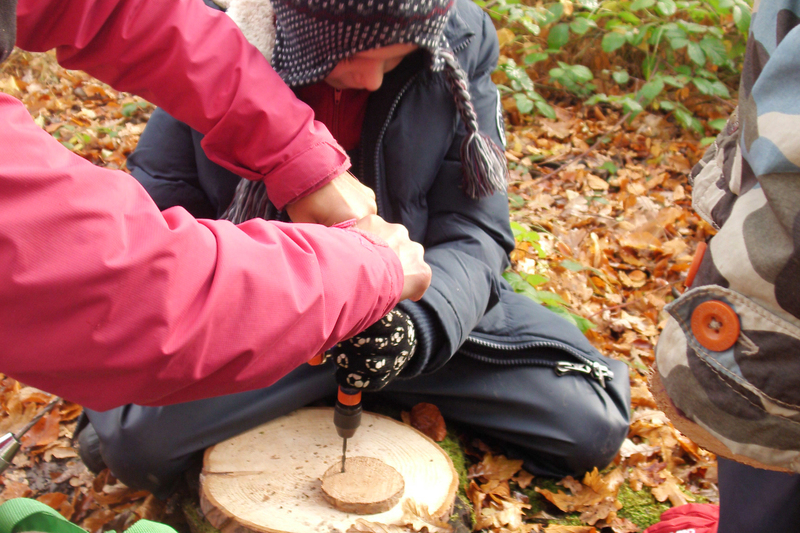 Key Stage 1 children (aged 4-7 years) also enjoyed using tools making tree cookies with hand drills at their Forest School sessions on the same day. Jen Hurst led classes outside on Day Four with engaging tree identification activities. Learning the names and uses of the trees will enable staff and pupils to use their school grounds more for outdoor learning. On the same day Years 5 and 6 (aged 9-11) learned how wood was used in the past by building a wattle and daub wall out of hazel and willow as part of their Anglo-Saxon history lesson. In classrooms teachers taught lessons related to Wood Week, including literacy by comparing Norway Spruce and Oak, debated the of felling trees, and produced artwork using materials from trees. 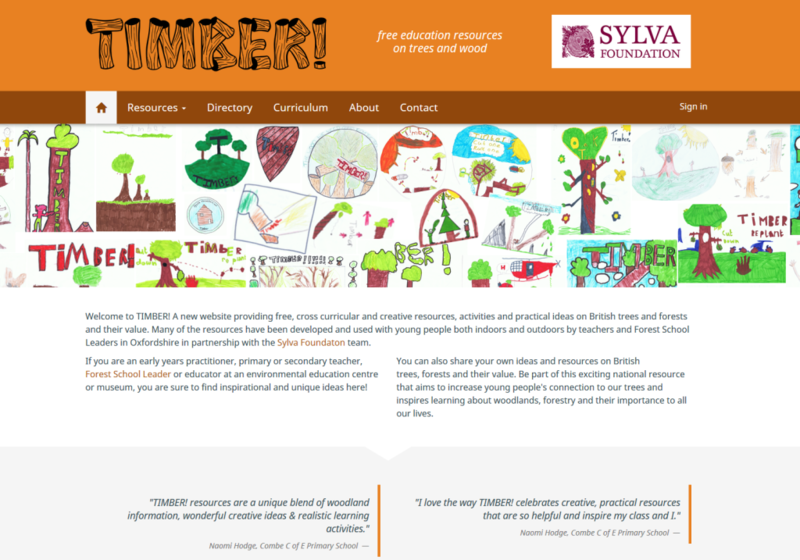 These lesson plans, resources, photos, films and activities will be uploaded onto TIMBER! website. The finale of the week was the branding of 10 logs of Lawson Cypress donated by Blenheim Estate. Julian Angus set up a ‘pop up’ Black Smith forge complete with bellows. 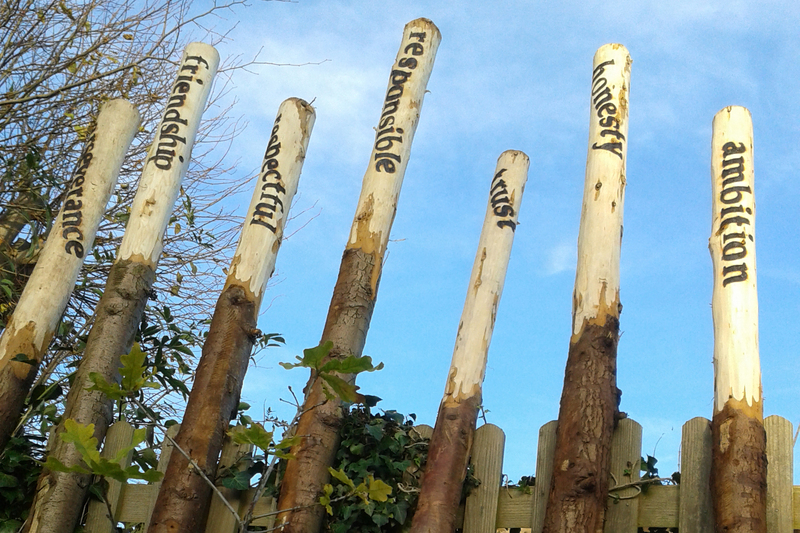 Key Stage two children selected the individual iron letters and branded the log poles to spell out the school’s values. 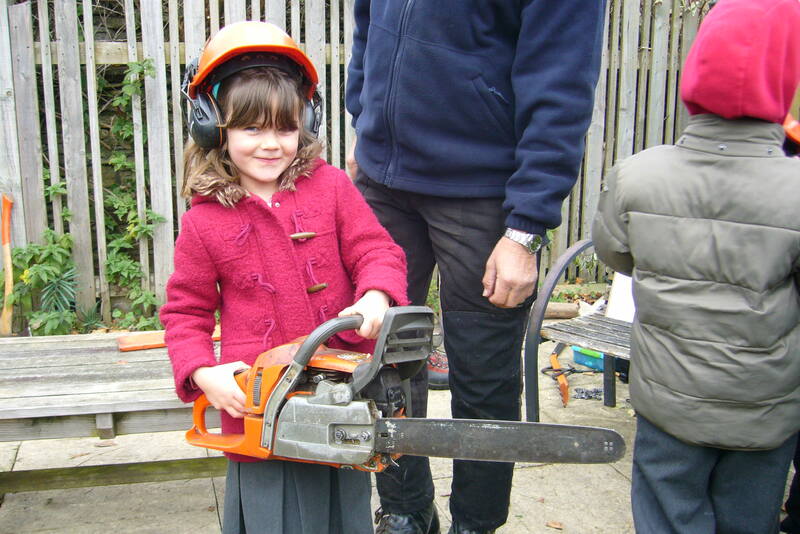 Key Stage one children helped shave the bark off the logs with a spokeshave. A final school assembly was held outdoors and the offspring of the OneOak tree, a young oak sapling, was planted to replace the Norway Spruce. 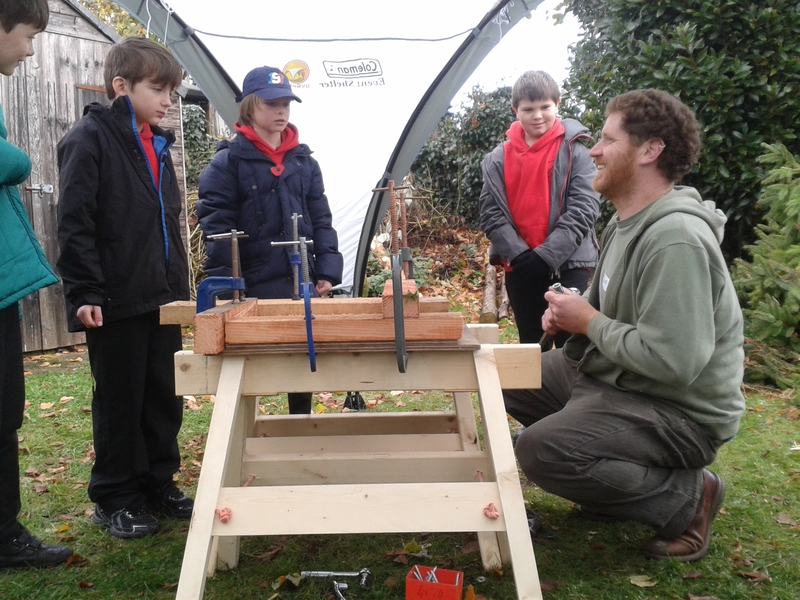 “it was the best week of my life!” and many children have expressed an interest in careers in forestry and woodwork. We’re excited to announce the launch of a brand new website: TIMBER! TIMBER! offers teachers and educators inspiring resources about British trees, forests and timber. Many of the resources have been developed from the Sylva OneOak project, with new materials provided by environmental educators across Britain. The TIMBER! website is free to use and is designed to enable teachers and educators to download and share resources. TIMBER! also includes a directory of links to other national organisations and networks, offering resources and information on topics relating to British trees, forests and wood. Funding from the Patsy Wood Trust supported Sylva in developing the TIMBER! website. Educators from ten schools and eight environmental education specialists offered insights and help in developing the website. Thanks to their involvement and ideas, the TIMBER! resource platform is easy to use and meets the needs of educators in searching for resources and information. In addition, many of the resources have been developed and tested with young people, both indoors and outdoors. The launch of TIMBER! is just the start. We hope that the website will attract more and more resources from people willing to share, and help young people learn more about the natural world. Do you have resources on British trees, forests and wood that you could share? If so, simply go to TIMBER! and upload your documents, photos, films, or presentations. The TIMBER! project has been funded by a grant from Patsy Wood Trust. 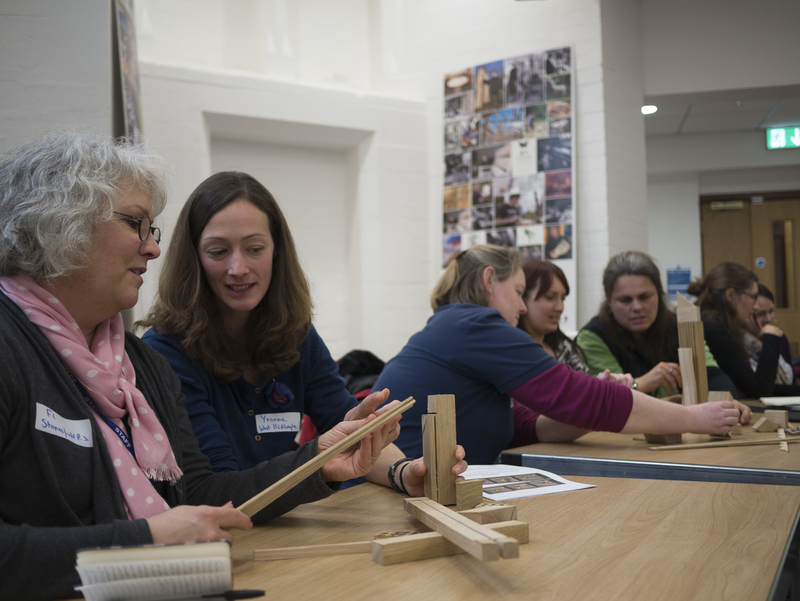 The seeds of many exciting woodland and wood education ideas were sown at a free CPD workshop run by Sylva’s Education Manager Jen Hurst this week. Kindly hosted by Oxford University’s Museum of Natural History, fifteen environmental educators, forest school leaders and teachers met with the Sylva team to develop an innovative follow-on project to OneOak – due to be launched nationally in September 2015. Watch this space! The workshop kicked off with inspiring talks from Sylva’s Gabriel Hemery on the story of OneOak, and the work of Foresters by Paul Orsi. Master Craftsman in wood furniture, Phil Koomen, then got participants hands-on with creating their own designs out of wood. The Museum of Natural History’s Education Officer Chris Jarvis took us on a virtual tour of forests around the world and the vast range of biodiversity that forests support. A highlight of the afternoon was the ‘Oak lifecycle game’ run by Lynn Daley, Education Officer of Oxford University Harcourt Arboretum. Passers by were curious to see workshop participants running across the Museum’s lawn, competing for vital resources to help grow their acorns to oak trees! The workshop buzzed with ideas as educators and experts went on to develop activities and resources for teaching and learning, both indoors and outdoors. Over the next six months these seeds of ideas are sure to grow into education activities that will go a long way to educating young people about Britain’s forests, woodlands, wood products and our growing wood culture. 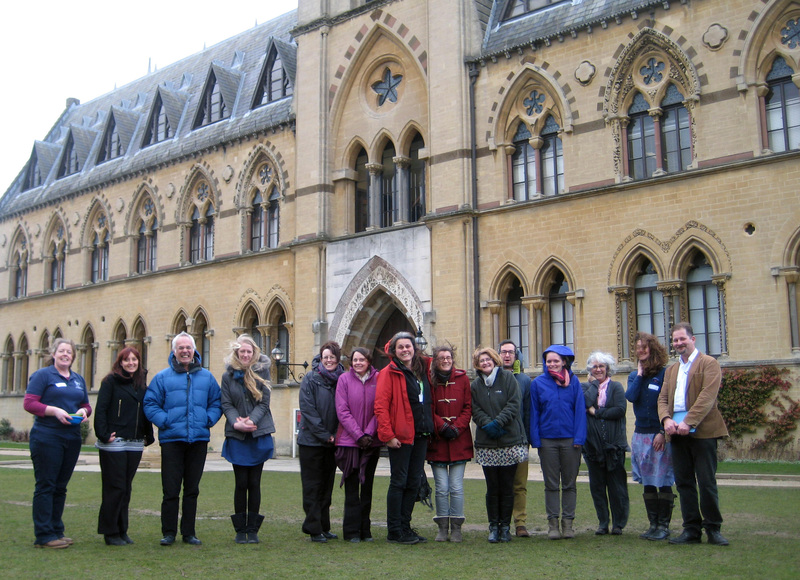 Our thanks go to all the enthusiastic participants, speakers and the Oxford University Museum of Natural History. Also to the funders of this new education project, the Patsy Wood Trust.